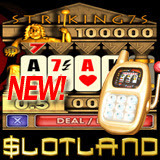 Slotland.com has added another Video Poker game – one that’s already a hit online -- to their suite of real-money mobile slot machines and video poker games. The long-popular slot machine web site was one of the first to offer mobile casino gambling when they launched their first slot machine for phones and PDAs back in 2005 and has been continually adding new mobile games ever since. "We've made substantial improvements since we first launched or mobile platform," said Slotland.com Mobile Marketing Manager, Martin Smith. "We now have two mobile slot machines and two mobile video poker games, and we now support over a thousand different mobile devices, including the Blackberry, which only a really small number of other mobile gaming platform providers support." "Striking 7s" is a video poker game, with a unique Doubling Feature. It has been one of the most popular games on the community’s web site since the day it was introduced earlier this year. After a win, Striking 7s players are offered the option to "Double or Collect". If they choose to try and double their winnings, another five cards are dealt and the player has one chance to pick the hidden high card. Slotland’s mobile players use the same account that they play with online and can deposit and withdraw from their mobile phone just as they would online. The mobile games are tied to Slotland.com’s Progressive Jackpot which is famous for being frequently hit for well over $100K. With more mobile games to choose from, and more of their players playing on their phones now, Slotland.com is seeing more and more wins on mobile devices. "Just last week we had two players win over $3000 playing on their phones," said Smith. "One was playing Lucky Stars and the other was Jacks or Better. We’ve a few people hit a Royal Flush on their mobile device. That’s a nice win – and they could have been just about anywhere when they hit it!"